This is my fourth trip this month–Chambersville, Georgia, North Carolina, Indiana, and now California on my way to Oregon for Austin’s #5. Traveling is a spiritual discipline for me. We can plan all we like, but there are always surprises. That’s why I seek to look at these travels as pilgrimage–a place to find God in new ways. That being said, I love the little luxuries that can be present during travel. 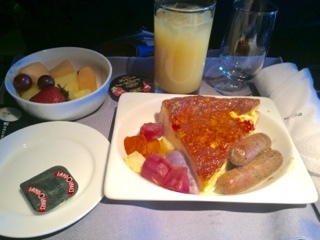 On this first long leg to San Francisco, I used travel miles to upgrade to first class. And I struggle. Is it being Christ-centered to place myself in such a place of privilege? As I was easing through security and then boarding with my premier status, I wondered about the ever so many others who are grateful simply to have a seat. To make it through security with time to spare. I pondered: what if I chose to board last (certainly a modern hair shirt)?What if I offered my good seat to someone seated in a middle seat near the back (a hair shirt indeed). I didn’t. I haven’t. My so-called servant heart hasn’t surrendered my aisle seat in first class. 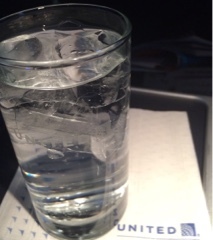 I’m enjoying my glass of sparkling water as others board. Having not to fret about breakfast has been sweet. And then there’s the hot towel. I know that some folks would say to me: You deserve it. Or you earned it. Or even, well, you paid for it. Truth is, I don’t deserve it and I didn’t earn it. I didn’t do anything special to have the resources to upgrade. It just is. The best I can do is be supremely grateful for my privilege. I can search for how I can serve those who have so much less privilege than I. Still. I am a pilgrim, so I pray. I give thanks for all that I have. It is so very much more than enough.